The remaining $30m will be left for the community, which law firm Leigh Day says was "devastated by the two massive oil spills in 2008 and 2009". 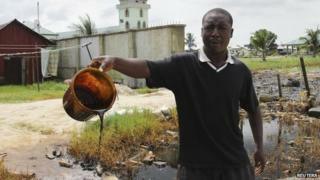 These were among the biggest spills in decades of oil exploration in Nigeria. Thousands of hectares of mangrove were affected in the southern Ogoniland region. BBC Nigeria correspondent Will Ross says there are hundreds of oil spills each year in Nigeria, some caused by leaks, others by sabotage, with local people stealing oil. The settlement was announced by the Anglo-Dutch oil giant's Nigerian subsidiary SPDC. "From the outset, we've accepted responsibility for the two deeply regrettable operational spills in Bodo," its managing director Mutiu Sunmonu said. Shell says that both spills were caused by operational failure of the pipelines. However, the company maintains that the extent of environmental pollution in the area is caused by "the scourge of oil theft and illegal refining". It also suggested that earlier settlement efforts had been hampered "by divisions within the community". This particular David v Goliath battle may be over but other suits against the international oil companies will follow. The law firm that fought on behalf of the Bodo community, Leigh Day, says it made sure everyone had a bank account set up so the $3,300 should hit their accounts soon. It may be far harder to follow the trail of the roughly $30 million compensation being paid to the community itself. It is telling just where this money is due to be spent. Chief Mene Sylvester Kogbara from Bodo says he hopes the money will be used to develop the community, especially education, agriculture and health. "We don't have a water supply," he told me. These are surely things that should have been taken care of by successive governments that have for decades squandered Nigeria's oil money. It is a stark reminder of just how badly the people of the Niger Delta and the rest of this oil-rich country have been let down. "It is the first time that compensation has been paid following an oil spill in Nigeria to the thousands of individuals who have suffered loss," the firm said in a press release confirming the development. The law firm said the initial compensation offered to the entire community was as low as $6,000. Lawyer Martyn Day, who represents the claimants, said it was "deeply disappointing that Shell took six years to take this case seriously and to recognise the true extent of the damage these spills caused to the environment and to those who rely on it for their livelihood". But he told the BBC that his clients were "absolutely delighted" with the deal that was struck. "What they feel particularly pleased about is that the individual money is going to them personally. In Nigeria mostly what happens is that chiefs bring claims on behalf of the community, the chiefs then get the compensation and the individuals seem hardly ever to see much of it. "So I think they're very pleased that we've been able to set up for them individual bank accounts." Has Nigeria's Niger Delta managed to buy peace?